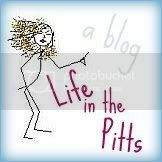 Life in the Pitts: I am not The Pioneer Woman. And that's ok.
Glad I found you through the Empress! Both yours and The Empress's swap posts struck a cord with me. I'm always constantly comparing my blog to others and it does make you miserable. Thank you for helping me realise I'm not the only one to do this! hi Alexandra! I loved Helena's post about blogging and now I love this one that you've written. I really do appreciate it when bloggers write about these issues that often no one talks about. You've hit this one on the nose for me. I often will read someone else's more eloquent/funnier/more concise blog and immediately think that I've come up short. In a split moment I also wonder if I should change the style of my blog accordingly. Actually, not for a split moment - I'd actually done it 4 times before I started (and stuck with) the blog I have now. Sometimes (okay, all the time) I get longwinded and sappy but after about 30 posts like this I realize it's just who I am, and if I try to be anything else then I'm just not going to be able to stick it out. It's like being in high school and trying to be someone cooler or more hip or whatever you are not. You can only pull it off for so long. Having said that, it never hurts to try and find ways to improve one's writing. That is what I am trying to do. I just need to remember the difference between improving and feeling like I am coming up short. I love it & she is absolutely right! We all have different experiences & stories and that's what makes each blog/blogger unique. You just have to keep telling your stories until you find your voice & somebody will listen. This was great! I definitely compare my blog to others. A lot. This was great advice. Also: I just read your guest post on the Empress, and it was awesome too! You have great tips. I really need to implement them more. I am going to try and write more of what I want to read. Great post! You both said it perfectly. Thank you, Helena, for the guest post swap, and for being who you are. You and I are a success story with the tribal hook up. Well, we're not a tribe, together, but we did meet through a tribe match up attempt, so, sort of, we're a tribe spin off. It worked out well, and it is a pleasure to know you. And I will be back, like, permanently. I love the Empress, and you rock. Your post over there was fantastic! And, I really love you because I can subscribe by email, which is the only way I ever keep up with any blogs! I'm not entirely sure I believe that you're not The Pioneer Woman. Because you're pretty amazing. PS I also am a big fan of email subscriptions. Thanks for that. The Pioneer Woman is freakin' amazing. It's why I don't go over there that much. Blog Envy...Life Envy...whatever. Seriously though...you have to do the blog for you. Make you happy. Who knows, maybe the top blog dogs read your stuff and think "Damn, I wish I was Kimberly"
This is an excellent and encouraging post. I'll admit, I felt overwhelmed a few months ago, but then put that aside and forged ahead. I'm glad I did because I was able to meet my great SITS PUG TRIBE! I fight the "so and so is so much better than me" demons all the time. But you're so right. We gotta just push through! So glad to be on your same tribe! Awesome guest post! just what i needed! :) i am queen of comparison and know that i need to just stop! thanks again - also, i gave you an award in my new post! I am here via The Empress and I have to say that I love you both! 2 fantastic and relatable posts. Great post! I always compare myself to other bloggers out there, but it never does me any good...I blog because I love to write, and that's all that matters, right? I found you through the Empress, and I'm glad I did. Enjoyed your post on her spot and her post on yours. I sure have my share of jelousy when reading other amazing bloggers. But then it´s just smarter to stick to what you can learn and how you can connect with that amazing blogger, right? I strive to keep only the good voices in my head, but it's really tough. It's more fun even in my own mind to focus on the negatives. Don't keep looking at your stats either. Nothing is more discouraging than constant stat checking. They are up, they are down. WHY?? I think what helps me is realizing that EVERYONE has a blog that they look at in envy. Except maybe the top 1 or 2 bloggers, but they don't count. But, everyone else looks at another blog and wishes they could have written that post or had that many readers or whatever it is. i pretty much do everything alexandra says so, yeah. points taken and noted. she ain't my fairy blog mama for nothing. and i promise i don't use the word 'ain't' on the regular. just when i've had too much sweet tea and living in the south starts to seep in. Thrilled that you two found one another and that Empress helped me find you, Helena! Both of your posts offer some fabulous perspectives on blogging! It is so, so hard not to compare ourselves to others- there is amazing talent out there. We just need to remember that the talent should inspire us to continue on and improve instead of backing away from the computer. Thank you, as always! Gosh, I just heart the Empress so much. It's something I have definitely struggled with forever as a writer, and, more recently, as a blogger. I have realized that I'll always come short if I compare my writing style, my posts, the number of visitors/commentors to my blog with some of the other bloggers out there who are clearly way more established than I am. But I've tried approaching it from a different angle: it gives me something to reach for. I WANT to improve in every way, so why not learn from the best?